NMR signals of the noble gas xenon are extremely sensitive to their molecular environment. In order to make this molecular specificty available for NMR contrast agents, xenon can be trapped in molecular cages that specifically bind to a certain analyte. 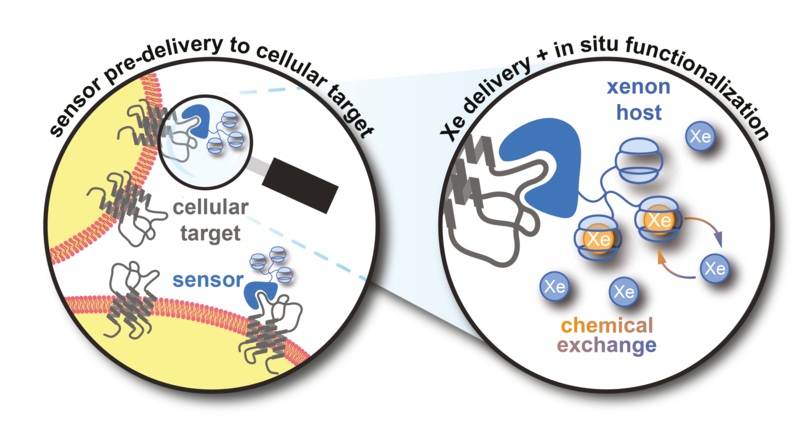 We functionalize Xe hosts to enable, e.g., binding events to targets of biochemical relevance. This is often reflected by a change in resonance frequency of the bound Xe. Spacers between cage and targeting moiety are optimized in terms length and structure for sensitive NMR detection. They are also equipped with additional functional tags like fluorescent dyes. Detection of the sensors via the Hyper-CEST method preserves the chemical shift information and allows separate read-out of different sensors.